Causes of show trials + purges of 1930s. Causes of show trials+purges of 1930s There have been many devastating events which have made great marks in history. Events of notable mention are the Nazi Holocaust of WW2, the use of the atomic bomb at Hiroshima, and the great terror of the 1930's in the Soviet Union. This great terror was sparked by a number of events, none more notable than the assassination of Sergei Kirov on the 1st of December 1934. There are many other reasons that the Soviet government use to justify these events, such as to defy attacks by counter-revolutionists, to clean up the Communist Party and to exterminate old ideals that are no longer supported by the Party. Historians argue these ideas to this very day, with many of them disagreeing on the topic of what actually provoked the purges. Some even argue the fact that Stalin should not have been in power, but instead he simply manipulated the government to his own ideals. However there is one thing that can not be disputed by any historian, and that is that fact that these purges and show trials were all major historical events, with much interest from across the world. The show trials and purges had a mixed reaction around the Western world, but by reading newspapers from the time of the incidents it can be seen that all countries come to a basic consensus. This consensus is that the actions that the Soviet Union took against the accused were inhuman and unnecessary. 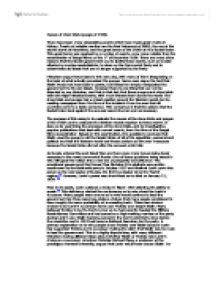 The purpose of this essay is to evaluate the causes of the show trials and purges of the 1930's and to evaluate the Western worlds reaction to these events. It does so by examining the processes of the show trials, and by investigating popular publications that deal with current events, from the time of the Sergei Kirov assassination. Based on this examination, it is possible to conclude that Stalin used the purge to rid the Soviet Union of all of his opposition, personal and political ...read more. This is perhaps illustrated by the fact that during the July days there was real pressure for change on the part of the urban masses and the Soviets, far from gripping the chance to take power actually put pressure on the people to stop demonstrating. This, therefore could almost be seen as a single powerbase in Russia. Ferro sums this up well as quoted above, the attitude of the people, going out on to the streets shows a dissatisfaction with the Soviets which derives, it could be argued from their position regarding the Provisional government. `The term dual power suggests two separate bodies working together, for a common aim, this therefore cannot be an accurate description of dual power in Russia. Even though during the July days there was no push by the Soviets to get power they believed that the February revolution was the start of the bourgeois revolution in Russia and, according to Marxist doctrine the Socialist revolution would follow later. Therefore by supporting the Provisional government for ideological reasons the socialists would seem to be supporting dual power but in reality they would only be supporting it until its downfall in the Marxist view of historical progression. The fact that neither group pushed total power in the first place is perhaps the most important reason to consider when looking at dual power. Hasegawa feels that the Provisional government over-estimated the control that the Executive Committee of the Soviets held over the mass of the people. This, combined with the idea that the Soviet should not take total power due to Marxist doctrine shows that neither felt that they could take total power on their own and entered into this system of dual power. It is therefore no surprise that socialist entered the coalition government from the Soviets. The July days and the Kornilov revolt were signals, it can be argued, of popular and elite opposition to the political system. ...read more. They swayed between the political ideas and parties that appealed to them. The Provisional Government was always in disagreement due to different wants and the problem of who was in control of the army and factories was another problem to face. Social divisions were becoming visible and Petrograd Soviets who held the majority of the power were beginning to turn towards the Bolsheviks. Trotsky joined the Bolsheviks in July also. Lenin and Trotsky together began taking advantage of the situation and the vulnerability of their opponents and the resentment of the citizens due to the war. They promised an end to the war, and Lenin adopted the quote 'Peace, Land, Bread', which appealed to the masses. All eyes were on the Bolsheviks. Action was expected and Kerensky used troops to close the Bolsheviks' printing press, enabling Trotsky to claim counter-revolution. Late at night on October 25 the Bolsheviks took the Winter Palace. Kerensky had no support and it was announced that power had been passed to the Soviet and a new government was set up with Lenin as the Chairman- 'The Council of Peoples Commissars'. Overall, all of these factors led to the Bolshevik Revolution in October 1917. However, not all factors were as influential as others were. The particularly significant events were the February Revolution as this produced a weaker power making it easier to overthrow. Also, the wars in 1904/5 with Japan and 1914 involving the great powers were important as they shook the regime and disrupted the economy. Bloody Sunday and the 1905 Revolt were influential as they displayed mass dissatisfaction, enabling the Bolsheviks to gain power. Furthermore, Marxism played a leading role in the revolution as it formed the basis of the Bolshevik Party and its ideologies. Yet, arguably, the revolution would not have occurred without Lenin who was the mind behind the Bolshevik strategies and timing. Perhaps Trotsky was also responsible as he had the oratorical skills to persuade the citizens to support him. Factors with smaller roles in the revolution are the population and structure, the July days and the Kornilov Affair. ...read more. The consequence of the triumvirate was that Trotsky's reputation was damaged which increased Stalin's chances of success in taking hold of Russia. Also, it meant that Stalin eliminated two party colleagues who could have taken control of the party, which again increased his chances of taking power of Russia. 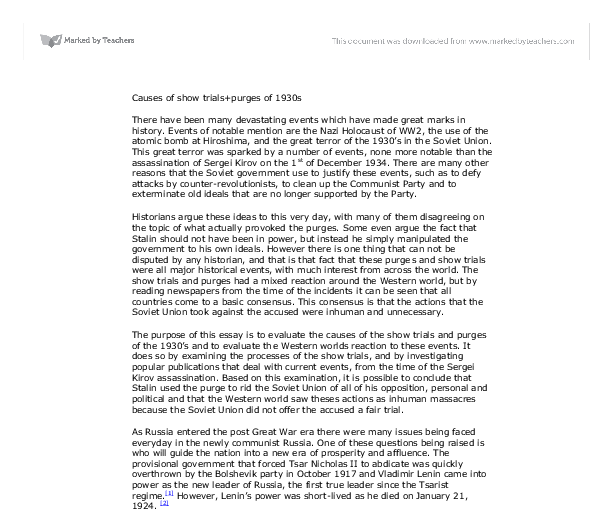 The biggest question any historian is faced with is; did the ends justify the means in Stalin's case? Looking separately at both overall achievement and price of progress, the position of Stalin in the context of wider Russian history seems to support the statement made about success at the cost of misery for the population. Revolution is that the monarchy was not only retained but strongly supported in the Rights of Man. Constitutional Article 3 states that 'the National Assembly has recognized...that the King's person is inviolable and sacred'18, leaving the monarch as the sole executive power with the governmental system still run in homage to him. to increase the population, so he began a substantial press campaign to encourage women to marry and have children, he even set a specific number of children he wanted to see in each family. He furthermore used the Family Law of 1944 to cause financial difficulties for families without children.